Imagine yourself walking through a garden of flowers. The scent of various plants filled your nostrils and colorful petals filled your sight in various shapes and forms. Then you see a flower unlike any other. A flower with a hundred small petals forming a sphere-like shape. What you have just imagined is a Chrysanthemum. A flower rich in history and meaning; A symbol of royalty and longevity. 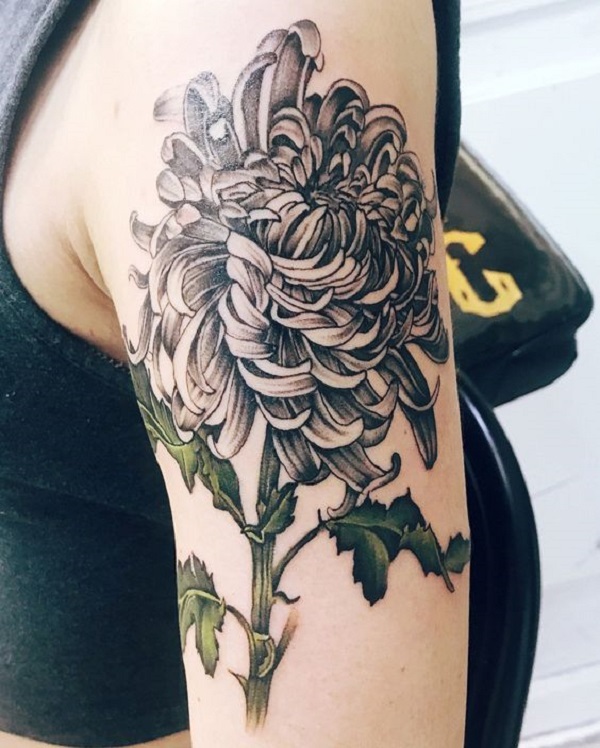 Due to the flower’s history and symbolism, Chrysanthemum tattoo designs was born out of the desire of tattoo artists and enthusiasts to have another tattoo design in their collection that can be interpreted in numerous ways. In this article, we will be providing you a rich curated collection of Chrysanthemum tattoo design that is rich in meaning and symbolism. We will also share with you the background on Chrysanthemums, its symbolism, and the perfect body placement for the said tattoo design. 1 What Is A Chrysanthemum? Chrysanthemums or sometimes called “mums” is a flowering plant that grows in Asia and Northern Europe. The flower was first cultivated in China as a flowering herb as far back as the 15th century BC. The plant is renowned as one of the “Four Gentlemen:” in Chinese and East Asian art. In Japan, where the flowering plant plays a big role in society, was first cultivated during the Nara and Heian periods (early 8th to late 12th centuries), and gained popularity in the Edo period (early 17th to the late 19th century). The Chrysanthemum captured Japanese society so much that the imperial family decided the chrysanthemum to be the imperial emblem of Japan. All imperial related works are to be named Chrysanthemum such as the Chrysanthemum Throne and the Imperial Regalia of the Imperial Family. In Western Culture, the flowering plant is usually grown to be cultivated for bouquets alongside other flowers such as tulips and lilies. Each color of the flower represents a different meaning which made it an all-time popular flower for various occasions. The meaning of chrysanthemum varies from society to society. In Japan, for example, the chrysanthemum symbolizes royalty because of the emperor’s use of the flower as the imperial emblem. In Australia, Chrysanthemums are considered as a symbol of love for mothers because “mums”, as they call it, is considered the official flower for Mother’s Day in Australia. In other parts of the world, the chrysanthemum signifies joy and beauty despite the oncoming winter since the flower blooms in the fall. 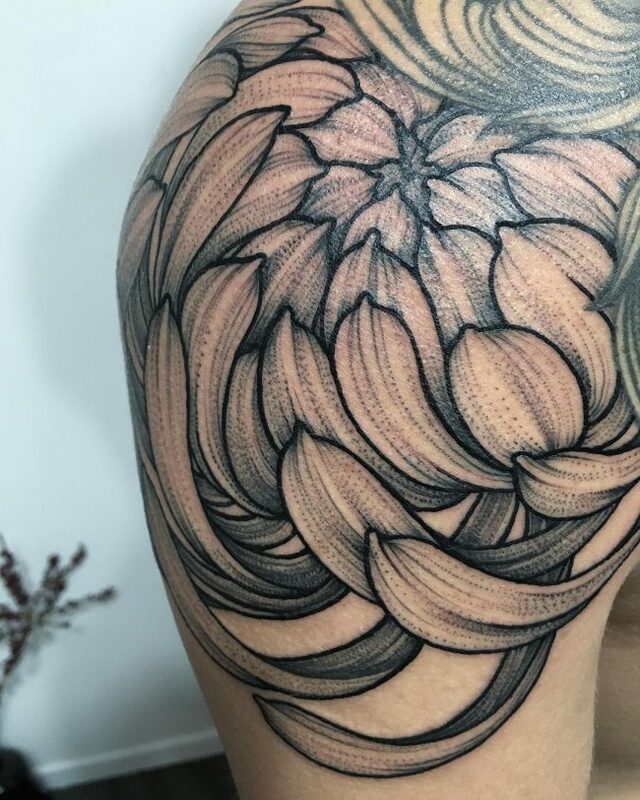 Chrysanthemum tattoo designs are not picky when it comes to body placement since you can morph the petals of the flower to fill the body part you desired to have it inked on. The usual places where people have it inked though is on the limbs area (sleeve, arm, shoulder, leg, thigh) as well as small body part areas like the ankles and wrists. There are other unusual places to have a Chrysanthemum tattoo also like the head for example. 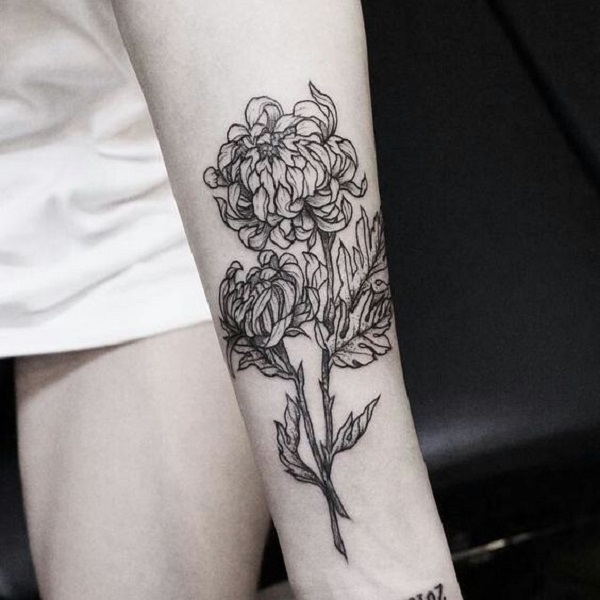 Since Chrysanthemums almost always have a uniform look, most chrysanthemum tattoo designs just have the flower inked on the body without any alterations at all. The only thing that would differ from one chrysanthemum tattoo to the other is the usage of watercolor as the ink of the said tattoo design. 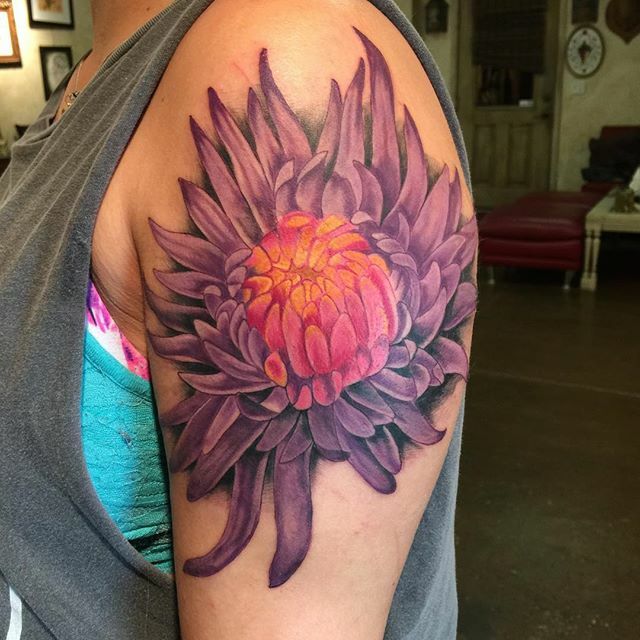 Here are some of the most beautiful chrysanthemum tattoo designs we saw on the web. 1. 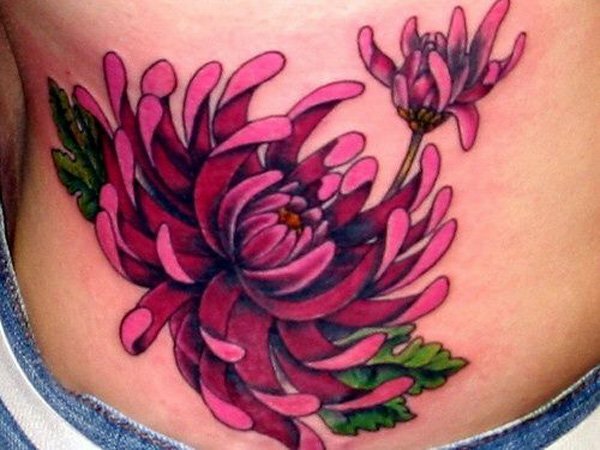 A large thigh tattoo of a pink chrysanthemum with a pocket watch. 2. 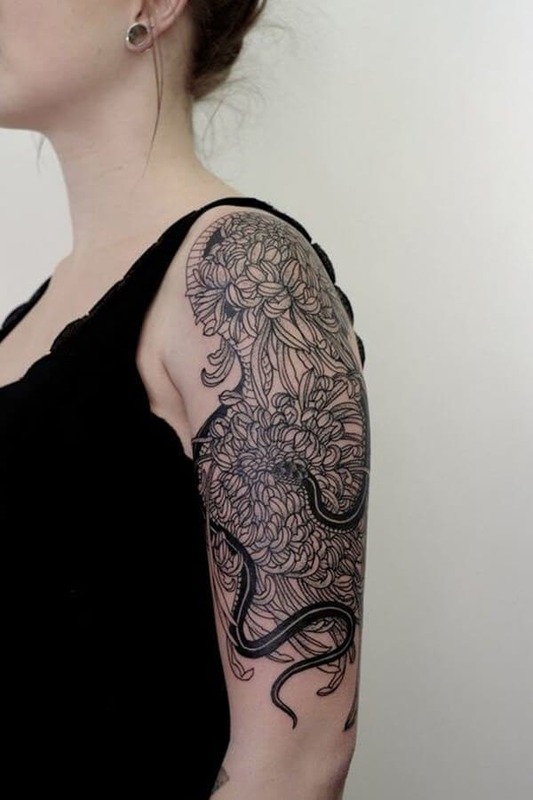 A large sleeve tattoo of a chrysanthemum with a snake slithering within its petals. 3. 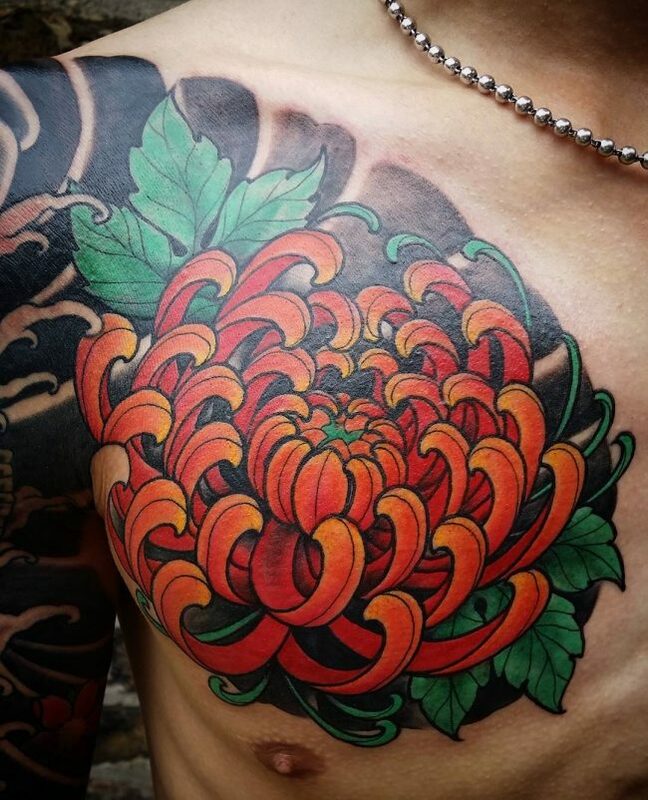 A shoulder tattoo of a chrysanthemum’s core petals. 4. 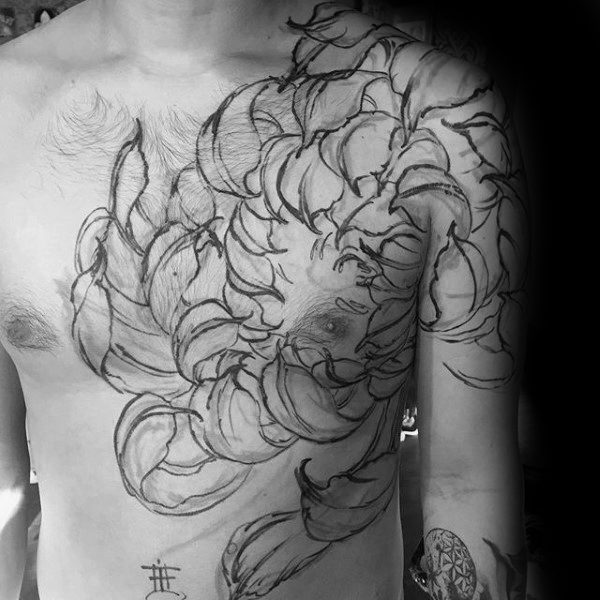 A large sketch-like chest tattoo of chrysanthemum petal’s that extends to the sleeve area of the body. 5. 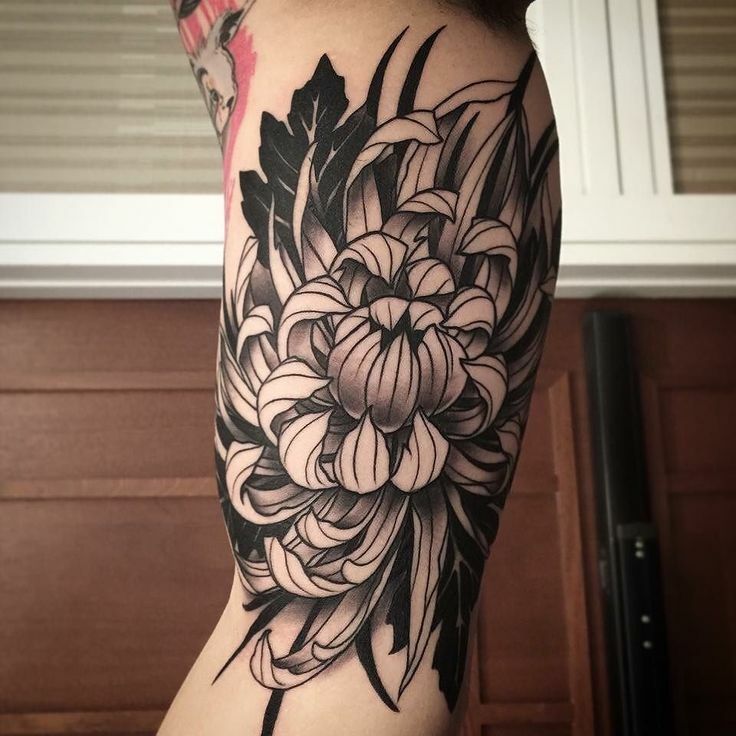 A large leg tattoo of a chrysanthemum with its stem. 6. 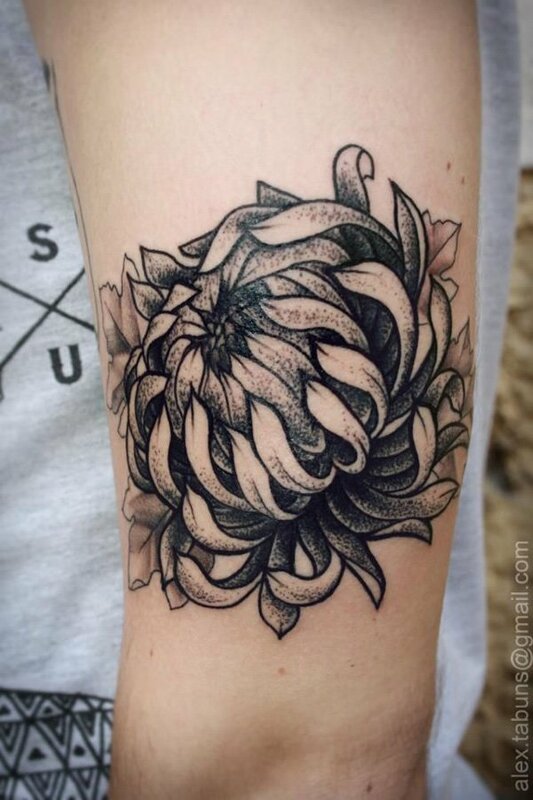 An arm tattoo of a chrysanthemum still with its prickly stems and leaves. 7. 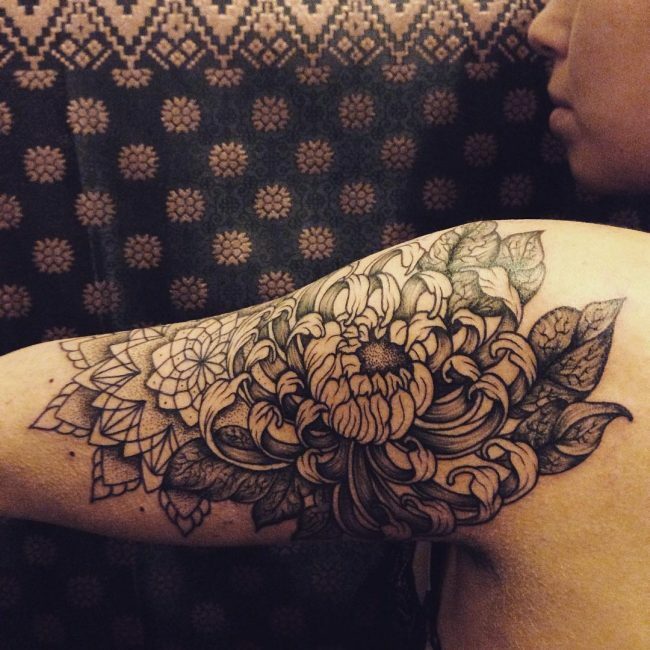 A large sleeve tattoo of a chrysanthemum with a Mandala. 8. 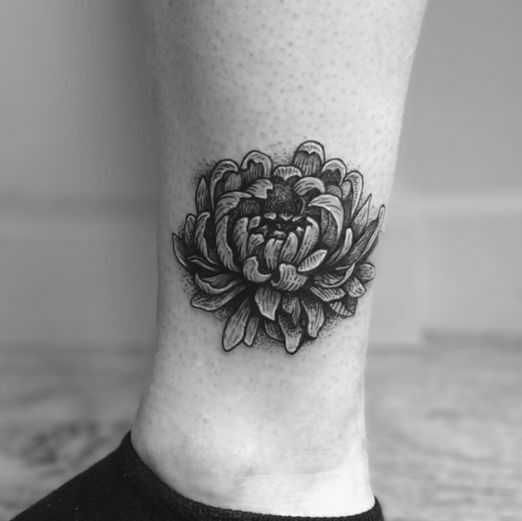 A small yet intricate ankle tattoo of a chrysanthemum. 9. 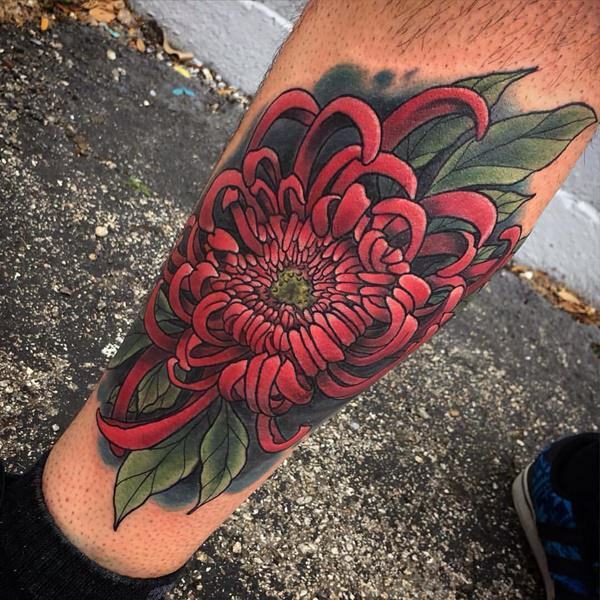 A large watercolor leg tattoo of a red chrysanthemum with its leaves. 10. 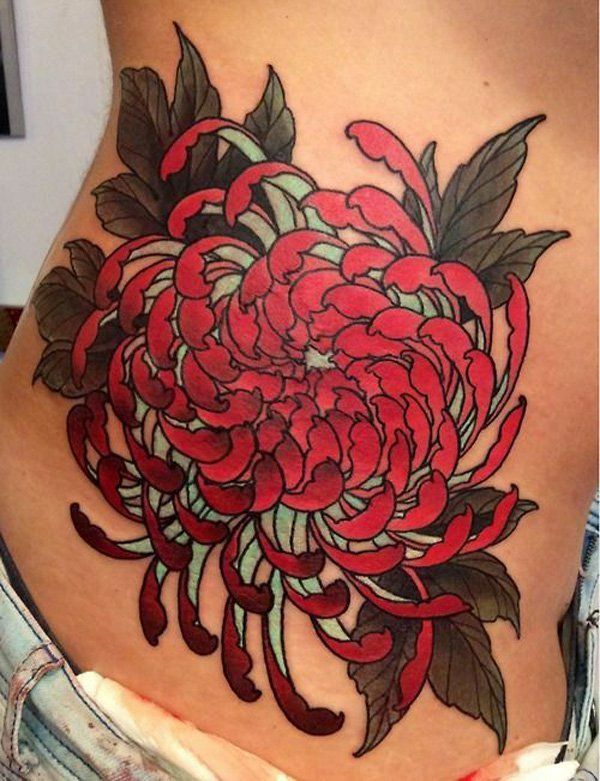 A large lower back tattoo of a red chrysanthemum with its leaves still attached. 11. 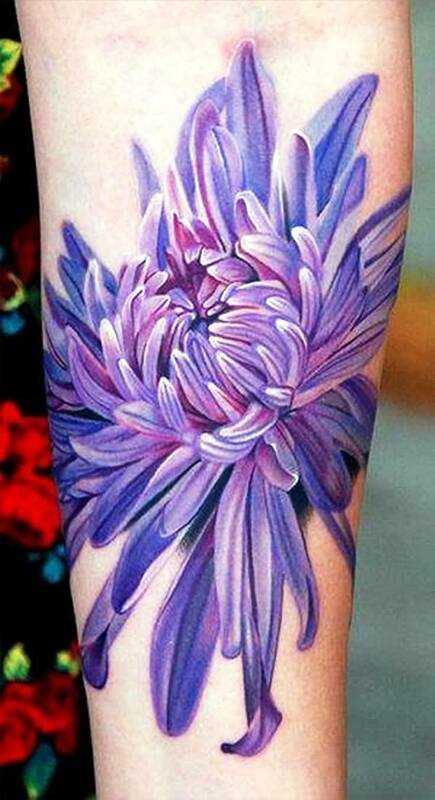 A watercolor sleeve tattoo of a purple chrysanthemum blossoming. 12. 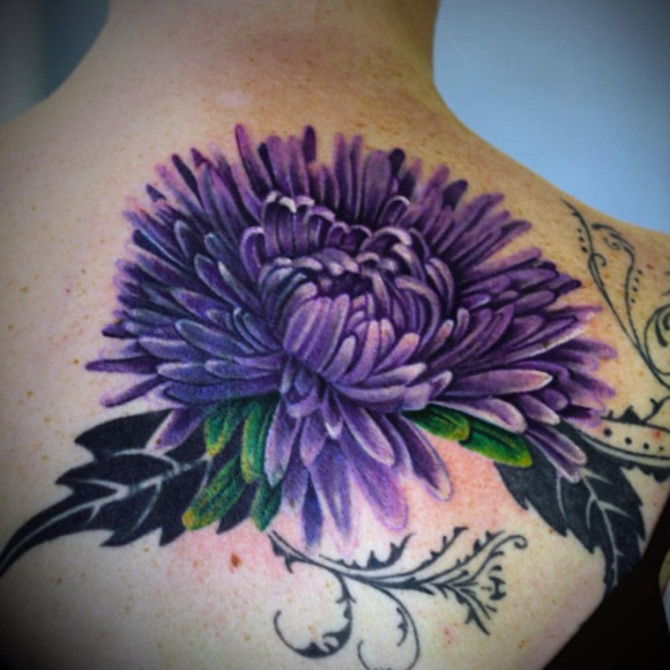 A watercolor tattoo of a purple chrysanthemum inked on the back with other artistic embellishments. 13. A large watercolor leg tattoo of purple chrysanthemum. 14. 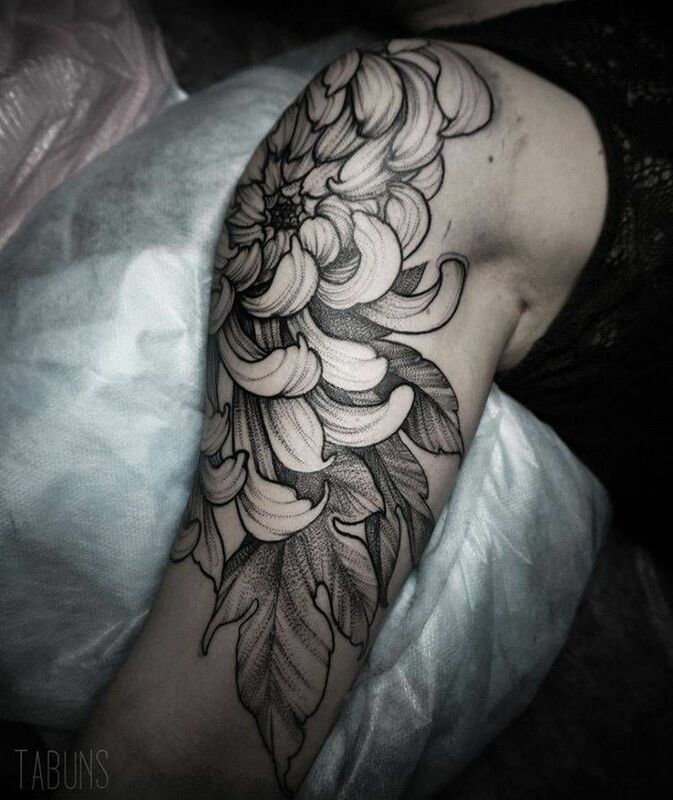 A monochromatic tattoo of a chrysanthemum with a high level of detail work on the petals. 15. A pink chrysanthemum tattoo on the back with watercolor as its ink. 16. Another highly-detailed chrysanthemum tattoo on the sleeve area. 17. 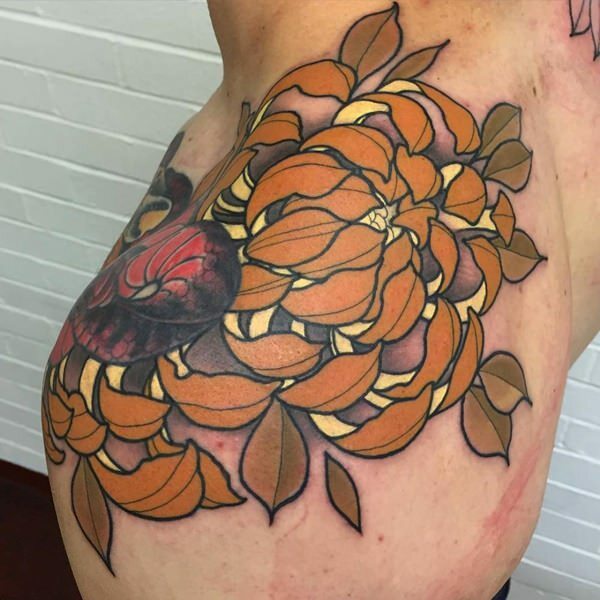 An orange chrysanthemum chest tattoo with leaves. 18. 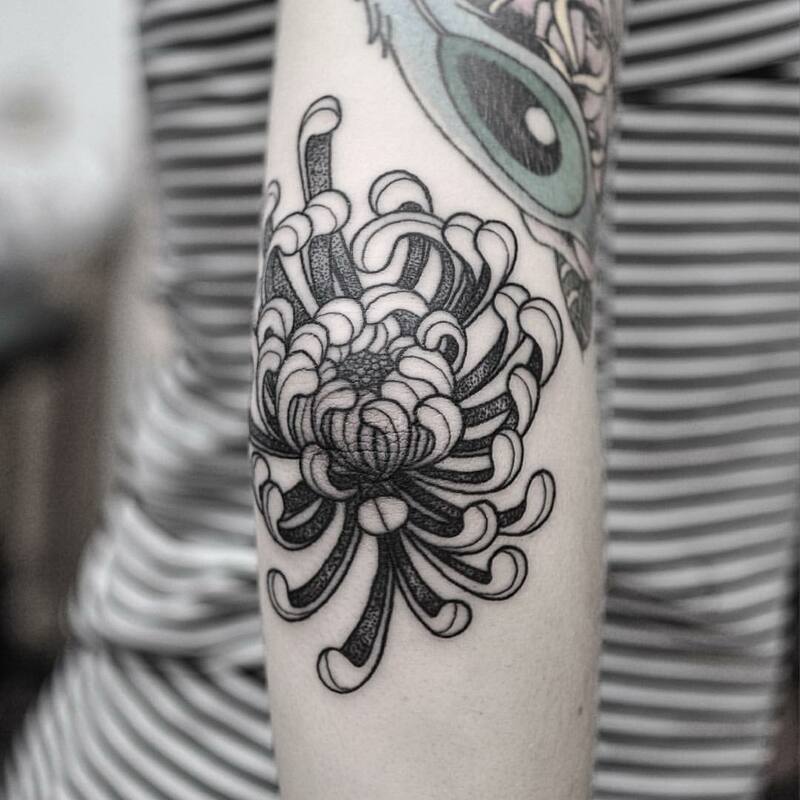 An arm tattoo of a blossoming chrysanthemum. 19. 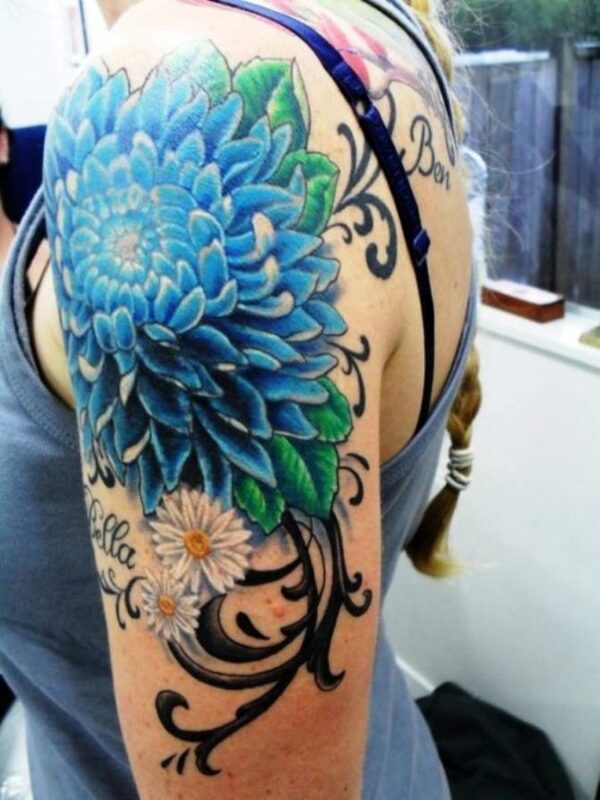 A large sleeve tattoo of a blue chrysanthemum with daffodils and artistic embellishments. 20. 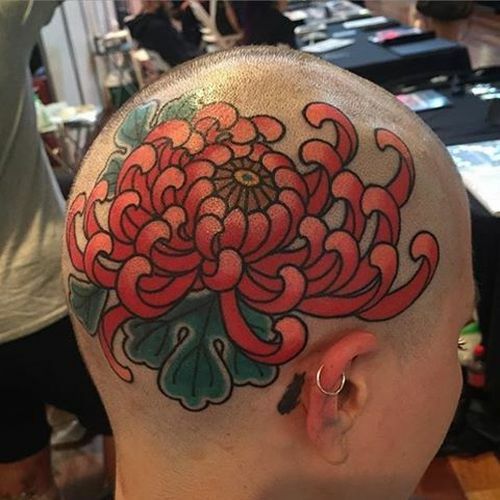 A large head tattoo of a red chrysanthemum blossoming. 21. 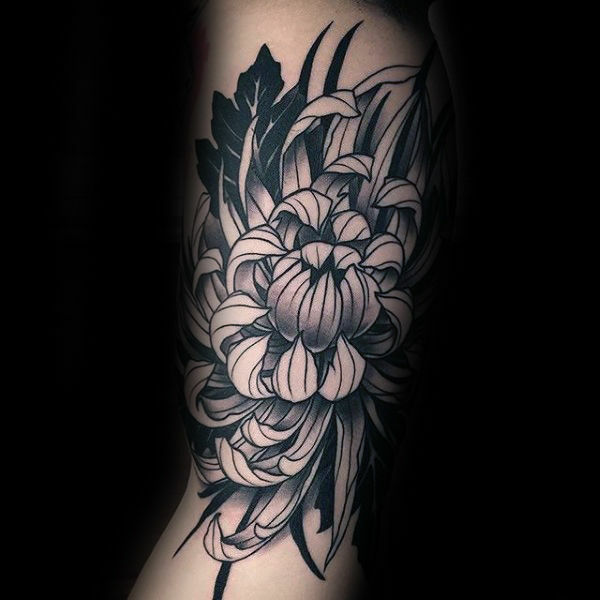 An intricate chrysanthemum sleeve tattoo with a green-colored stem. 22. 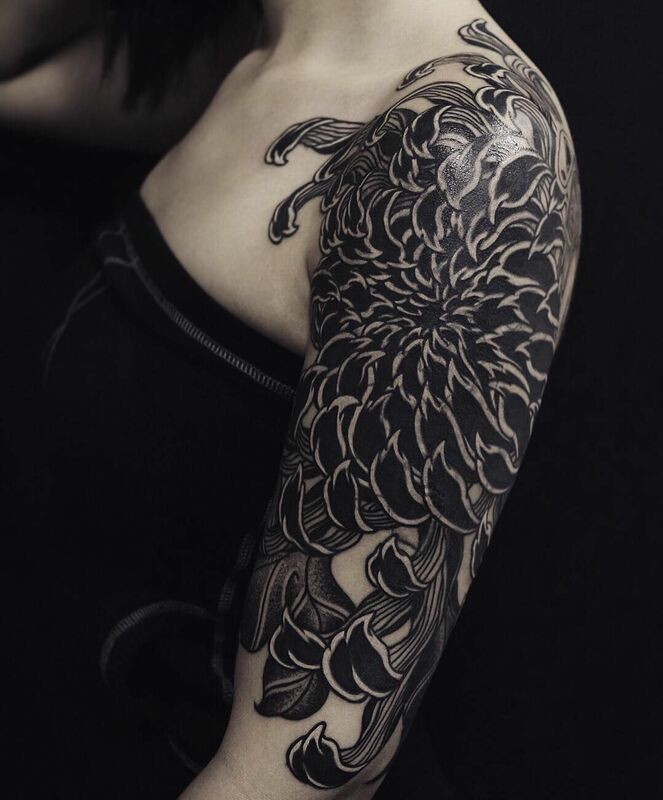 A large highly-detailed monochromatic sleeve tattoo of chrysanthemum petals. 23. 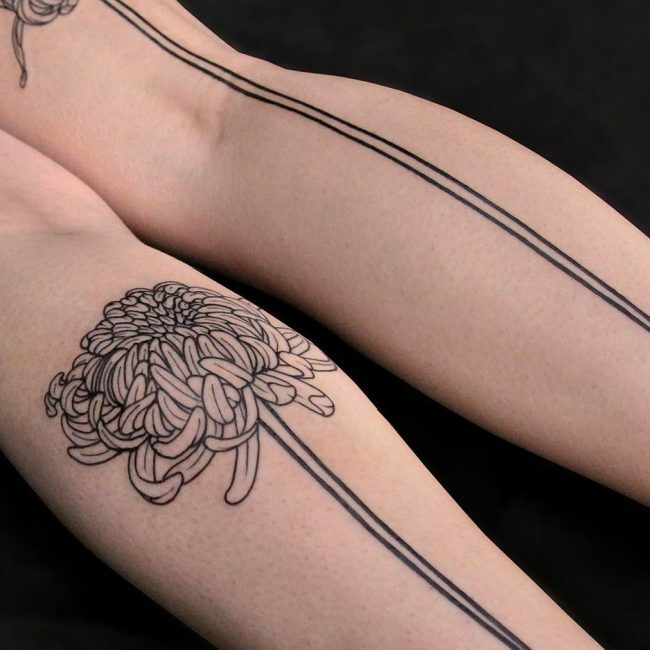 A large leg tattoo of a blossoming chrysanthemum. 24. A watercolor tattoo of a chrysanthemum at autumn with its petals falling from the core. 25. A sketch-like arm tattoo of a chrysanthemum blossoming.